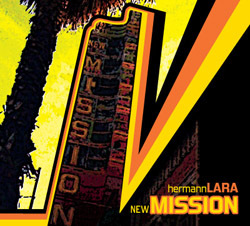 Hermann Lara's Uncommonly Good "New Mission"
One of the Bay Area's best saxophonists is the incomparable Hermann Lara. Celebrating the arrival of his debut CD, "New Mission", which was recorded live at the historic former Mercury & CBS Records Studios on Mission Street in San Francisco. New Mission delivers 11 original, classic set tunes in an array of jazz rhythms. Legendary guitarist and 6 time Grammy Nominee, Mike Stern, makes a special guest appearance and the all-star packed roster of musicians on this disc deliver what are sure to be some of most exciting musical moments of 2011. Based in San Francisco, saxophonist and woodwind player, Hermann Lara holds a Bachelor's of Music from the Berklee College of Music in Boston, MA (1996) and a few notches earned in the bandstand as well. As a husband, father, business man, teacher and musician he’s in a unique position to convey the complexities and beauty of modern life in America through music. Usually found attached to an alto or tenor saxophone, Hermann is equally at home on all the members of the saxophone family. In addition to saxophone, he teaches and performs on flute and clarinet. Born into a musical family and raised in the vibrant and rhythmically pulsing Mission District of the 1970’s, Hermann absorbed the Latin rhythms of his Salvadoran family and the American jazz and R&B supplied by his barrió. His father, a respected singer and guitarist, filled his household with great Latin American songs of the 1920’s and 1930’s,however, it was his next door neighbor, Art Sato, longtime KPFA jazz stalwart, who fruitfully altered his course by filling his ear with jazz early on. It was the music of Miles Davis, Junior Walker & Bird which kept him up late at night with a Walkman glued to both ears. By age 15, Hermann was performing with other young, local jazz musicians in the Bright Moments’ Music Lovers Club directed by the late bass legend Herbie Lewis. In addition to studying with Herbie Lewis, Hermann studied at Capp Street’s Community Music Center with Ken Rosen and Lisa Pollard. Studies at the music center led Hermann to the Berklee College of Music on scholarship and to study with world renowned reed masters Joseph Viola, Billy Pierce, George Garzone, Jerry Bergonzi and Matt Marvuglio. Hermann has performed with such music greats as Paquito Guzman, Pedro Arroyo, Giovanni Hidalgo and grammy winner Lalo Rodriguez. He’s recently recorded Fito Reinoso's Ritmo y Armonia, Tito y Su Son De Cuba and singer/songwriter’s JL Stiles and Amelia Ray. In the SF Bay Area don’t be surprised if you catch him on stage with Michael Lamachia’s Organic Jive Collective, Stymie & the Pimp Jones Luv Orchestra, Bulk, The James Moseley Band, Bolero y Mas, Dandara and the Pragandaia Band, Cubanacan and many more. Hermann is currently a faculty member at the New Mozart School of Music in Palo Alto, CA teaching all the woodwinds and performance studies. "New Mission" is an album well worth adding to your collection, from one of the most creative minds on the local scene.